Are you tired of having stained, yellowish teeth? Are you looking to brighten your smile and improve your appearance? Do you wish to have beautiful, white teeth? Then teeth whitening may be the best cosmetic dental treatment for you! As we age, our teeth will naturally darken as a result of certain foods, beverages, medications, and habits. Luckily, whitening your teeth is an easy and effective way to remove stains and improve the color of your smile. 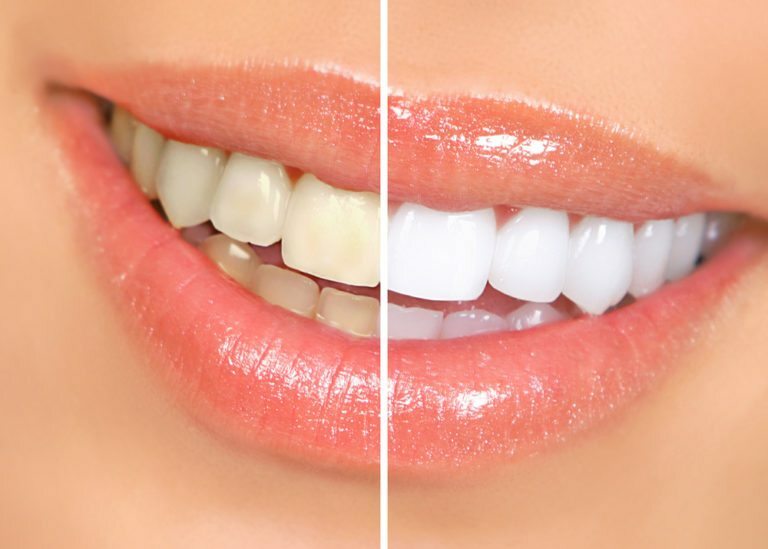 In a single teeth whitening session at Legacy Dental, your teeth be lightened about 5-10 shades! In addition, Legacy Dental also offers a take-home whitening kit. With so many options, you are sure to find an option that works for you! According to the American Dental Association, teeth whitening procedures are one of the most popular cosmetic dental treatments in the United States. If your teeth are stained but otherwise healthy, you may be an ideal candidate for teeth whitening. However, if you are pregnant, sensitive to whitening materials, or have gum disease, worn enamel, cavities, or exposed roots you may not be an ideal candidate for teeth whitening. To find out for sure if teeth whitening is right for you, schedule a consultation with one of our dentists at Legacy Dental today! To understand how teeth whitening works, you will first need to understand basic tooth anatomy. Your teeth are composed of three layers: the enamel, dentin, and pulp. The enamel is the outermost and hardest layer of your teeth. 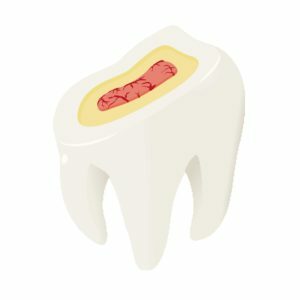 Directly under the enamel is the dentin, which is a porous hard tissue that protects the pulp, or innermost layer of your tooth. Both the enamel and the dentin can become stained over time. There are two types of stains: extrinsic and intrinsic. Extrinsic stains are used to describe stains on the surface of your enamel, while intrinsic stains are used to describe stains that lie under the surface of your teeth within the dentin layer. Extrinsic stains are the result of heavily pigmented beverages, foods, tobacco, and routine wear and tear. These stains can usually be removed by brushing or a dental cleaning. Intrinsic stains develop as a result of trauma, aging, exposure to minerals, and the excessive exposure to fluoride. These stains cannot be removed by brushing and require a cleaning method that penetrates to the dentin layer. Legacy Dental uses Opalescence Whitening to remove both intrinsic and extrinsic stains from your teeth. Opalescence whitening gel contains either carbamide peroxide or hydrogen peroxide. Both substances are able to remove stains from the enamel and penetrate to the dentin below. The oxygen molecules within them break the chemical bonds of the discolored molecules, effectively whitening the teeth. 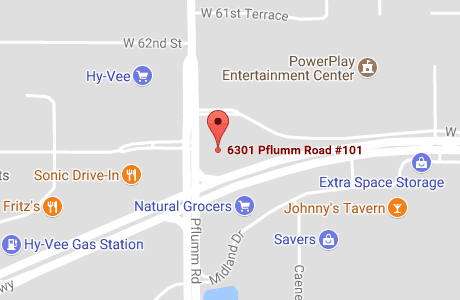 What can I expect from teeth whitening treatment at Legacy Dental? Whitening treatment at Legacy Dental can take several forms: take home, prefilled, and in-office treatments. Our dentists will discuss these options with you to help you determine which teeth whitening option will work best for your whitening needs. The Opalescence take-home whitening gel contains PF (potassium nitrate and fluoride) and five different concentrations( 10%, 15%, 20%, 35%, 45%) of Carbamide Peroxide. It also has three different flavors including: mint, melon, and regular. Depending on your whitening goals, you may wear Opalescence whitening trays for as little as 15 minutes a day to wearing them overnight. The whitening trays will be custom-made to fit your mouth. To fabricate your custom trays, our dentists will need to take an impression of your mouth. Opalescence Go are prefilled, disposable trays that are ready to go. Like the other take-home gel, they contain PF (potassium nitrate and fluoride), however they are premixed and only come in 10 and 15 percent concentrations of Hydrogen Peroxide. The 10% concentration is to be worn for 30-60 minutes a day for 5-10 days. The 15% concentration is to be worn for 15-20 minutes a day for 5-10 days. The gel can be either mint or melon, and comes in a clear tray that fits any smile. Legacy Dental uses Opalescence Boost for our in-office teeth whitening treatment. The in-office treatment uses a 40% hydrogen peroxide solution in addition to the PF (potassium nitrate and fluoride) found in the other treatments. During your in-office whitening treatment, one of our dentists will first clean and polish your teeth. Then, they will apply the whitening gel to your teeth. The gel is chemically activated, meaning that a light is not needed. This gel will sit on your teeth for about an hour and then be rinsed off. Is there any post-treatment care I will need to follow after having my teeth whitened? After having your teeth whitened, you may experience some minor tooth sensitivity. This is normal and should fade within a few days. Directly after having your teeth whitened, you may also be directed to avoid heavily pigmented beverages such as tea, coffee, and wine in the first 24 hours to prevent staining. This because your teeth will continue to whiten for up to 24 hours after your in-office treatment. The final results of your whitening treatment may take up to two weeks to fully develop. To keep your teeth bright and white, our dentists may also recommend Opalescence Whitening toothpaste and toothbrushes. Their whitening toothpaste is less abrasive than other toothpaste, contains more fluoride, and can continue to remove surface stains and lighten your teeth up to 2 shades in a month. In addition, you will want to practice good oral habits to keep your teeth white for as long as possible. This entails brushing twice a day, flossing once a day, and visiting Legacy Dental twice a year for your dental checkup and professional teeth cleaning. You may also want to decrease the amount of heavily pigmented beverages you consume, or rinse your mouth after consumption to reduce the chances of staining. Finally, you will want to avoid smoking because this can also stain your teeth. Will teeth whitening work on dental restorations such as dental crowns, veneers, and composite fillings? Unfortunately teeth whitening only works on natural tooth structures. This means that dental restorations cannot be whitened in the same way as your natural teeth. However, depending on the type and location of your dental restoration, you may still be able to have your teeth whitened. If you have concerns about a dental restoration, schedule a consultation with one of our dentists at Legacy Dental and we will discuss your options. The two main active ingredients in Opalescence teeth whitening gels are Carbamide Peroxide and Hydrogen Peroxide. Hydrogen Peroxide is one molecule away from being water and Carbamide Peroxide breaks down to Hydrogen Peroxide when exposed to water. As such, both these chemicals are considered to be safe if used properly. With any type of dental treatment, there are always risks involved. The most common risks associated with teeth whitening include tooth sensitivity, gum irritation, and technicolor teeth. Although some sensitivity is normal, this sensitivity can be greater or last longer in individuals with gum recession, cracks in their teeth, or leakage from a faulty restoration. To combat possible tooth sensitivity, you may want to purchase a toothpaste with potassium nitrate. Potassium nitrate will help reduce sensitivity in your teeth. 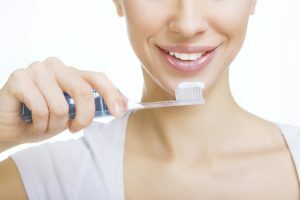 It may also be recommended to start brushing with a sensitive toothpaste for a week before your whitening treatment to reduce post-treatment sensitivity. This is most common in individuals who use the take-home whitening trays. Your gums can become irritated from the bleaching solution, the plastic trays, or a combination of both. Gum irritation will last several days until the peroxide concentration is lowered. If you have sensitive gums, you may want to consider having an in-office treatment to avoid gum irritation. Technicolor teeth is the name given to teeth with restorations. Dental restorations will maintain their color while the natural tooth structure around them will lighten. This can create an uneven coloring across the teeth. To avoid this, your restorations may need to be replaced after your teeth are whitened. To find out more about preventing technicolor teeth, talk to our dentists about your options. The cost of your teeth whitening treatment will depend upon the number and type of treatment you decide on. In general, the Opalescence take-home whitening kits can cost approximately $100-$400. An in-office Opalescence whitening treatment can average around $650. How long with the results from teeth whitening last? In general, your teeth should stay whiter for about three years. However, this can vary depending on how well you take care of your teeth. Frequently eating or drinking things that can stain your teeth and smoking can all decrease the lifespan of your teeth whitening results. Teeth whitening is not intended to be a permanent solution to tooth discoloration. For this reason, maintenance and “touch-ups” are required to achieve prolonged results.